This Thanksgiving, try a vibrant twist on your holiday potatoes. Butternut squash provides a golden hue, while sage and olive oil bring that Thanksgiving flavor. Enjoy! Wash the exterior of the squash, and pierce it a few times. Place squash on a baking sheet and bake for 50-60 minutes. Wash potatoes and cut into chunks. Place potatoes into a large pot and cover with salted water. Bring to a boil. Continue to boil until potatoes are fork tender. Drain potatoes and return to pot. Cut butternut squash in half lengthwise (stem to end). Scoop out and discard seeds. Scrape squash flesh into the pot with the cooked and drained potatoes being careful not to add any skin. 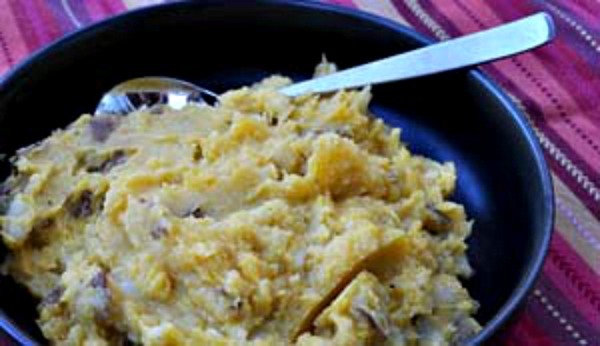 Mash potatoes and squash together with a potato masher. Mix in remaining ingredients. Stir to thoroughly combine.